The 4th of July is Independence Day here in the United States. It is the celebration of the signing of the Declaration of Independence in 1776. Traditions include watching fireworks, having a barbecue, drinking beer, wearing red, white and blue, etc etc. Basically a big party featuring the American Flag! 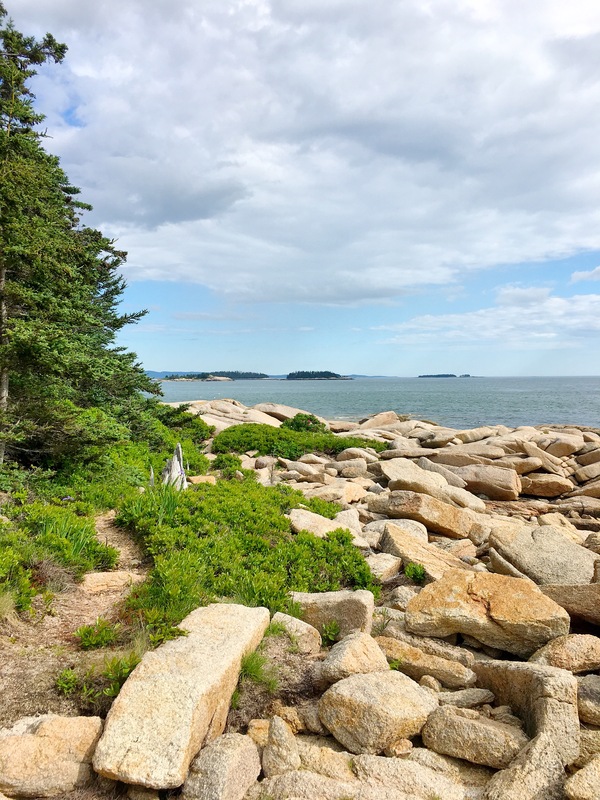 My family, parents and I are on vacation in Maine, which is a little different from our norm for 4th of July, but what a gorgeous diversion! Today we did a little relaxing and then a little hiking, followed by some barbecuing! 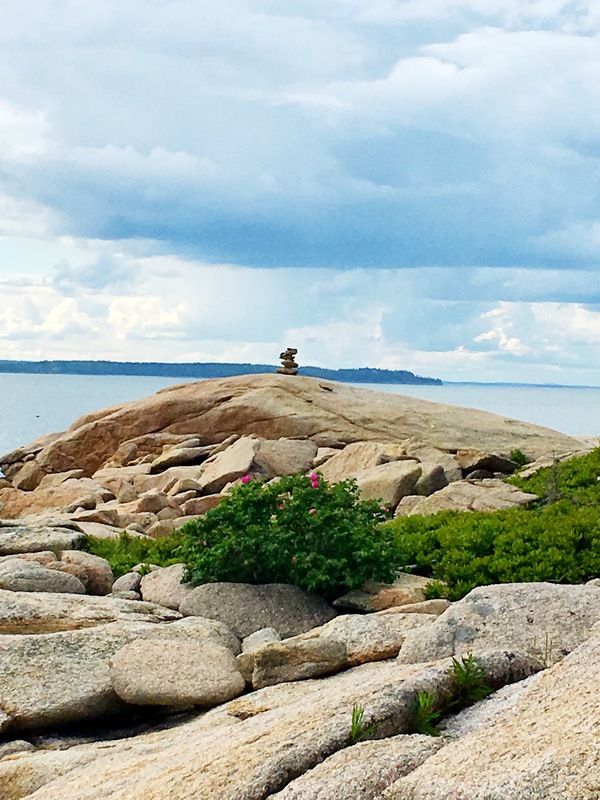 We hiked out to Barred Island to the sandbar and then around the island. So beautiful and peaceful! After our hike, a little decadence was in order. I recently got a few new cookbooks on our way up here, one of which was New England Open House. 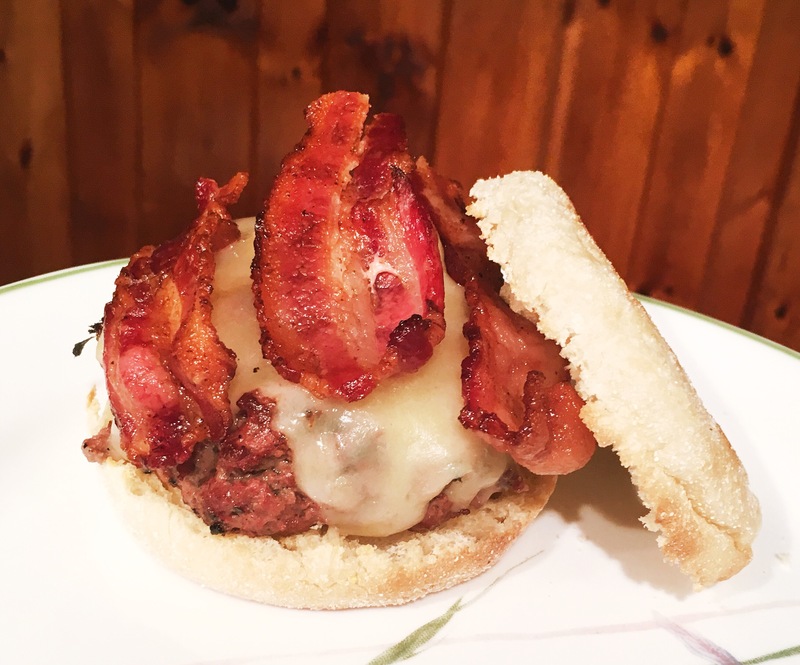 The recipe I choose for today was adapted from the author’s New England Style Hamburgers. Nothing too fancy, but very tasty! I got some local (as in from a farm a few miles away!) 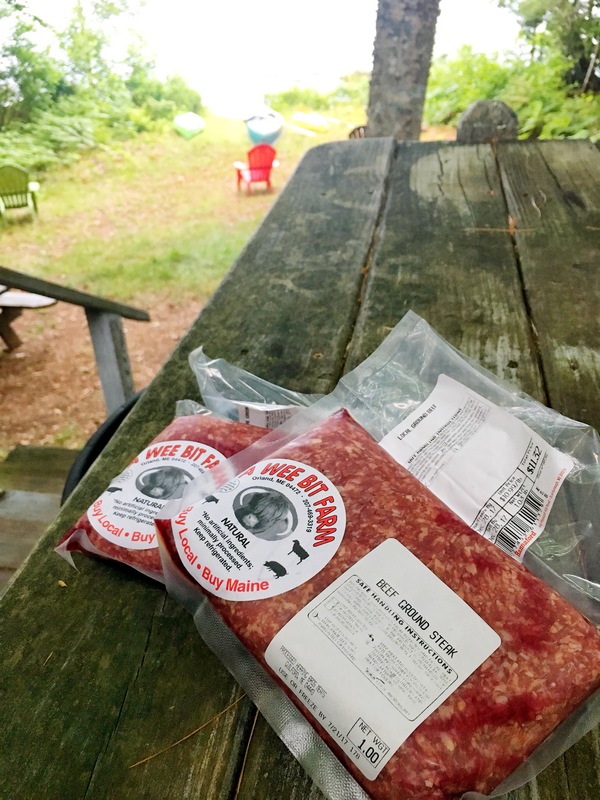 beef and Vermont cheddar cheese from the Tradewinds market in “town”, as well as some maple smoked bacon. I really think the local, fresh beef made all the difference for these burgers. 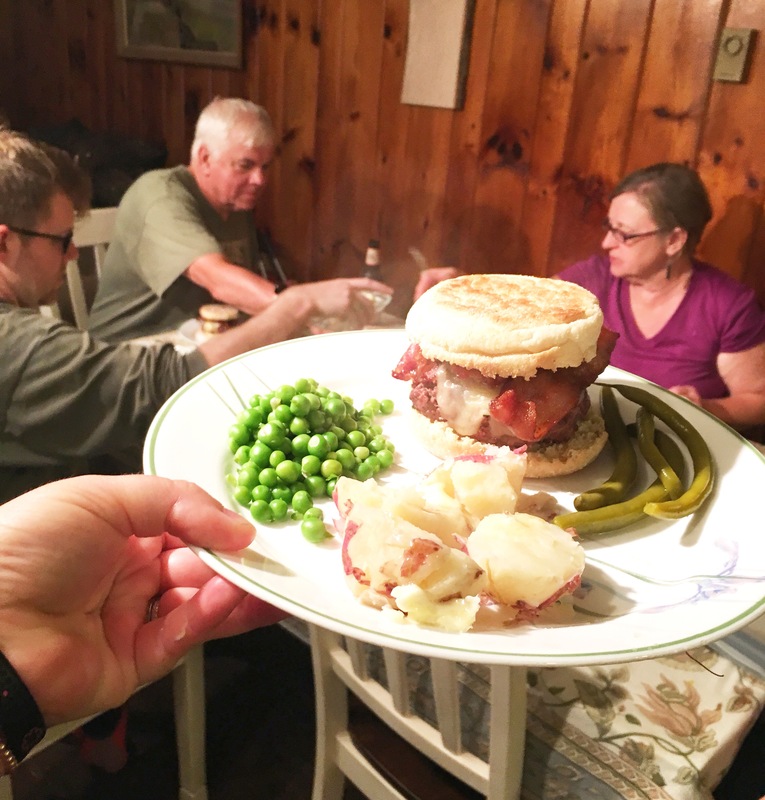 The other unique idea for these burgers, suggested by the cookbook author, was to use toasted English muffins instead of buns. Those nooks and crannies just soaked up the juices–yum! 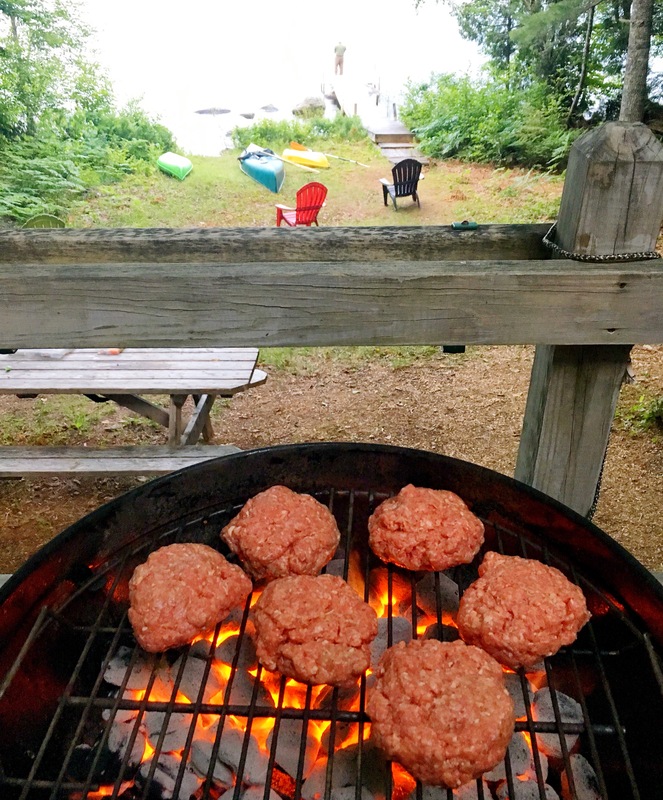 I formed the patties and fired up the charcoal grill. Nothing like grilling with a view! I slapped on some of that Vermont cheddar cheese and let it melt for a bit. 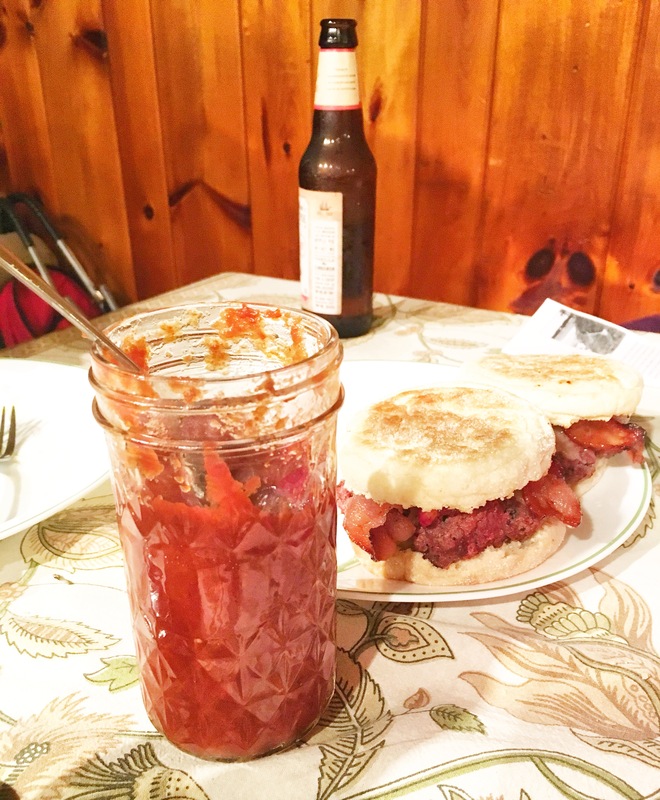 I then assembled the burgers by placing them on a toasted English muffin and topped with bacon and my mother’s homemade ketchup. Devine! The best part, by far, was hearing about my mother’s Independence Day traditions from growing up. She told the story of when she was little, her father would get up in the morning on the 4th of July and shoot his gun–just once. He would then go harvest some peas and new potatoes from their garden. That would be their Independence Day feast. My mom carried on this tradition today by providing us with peas and new potatoes from my parents garden. With my mother’s pickled beans also on the side, this meal was like something brought down from heaven! What are some of your Independence Day traditions? 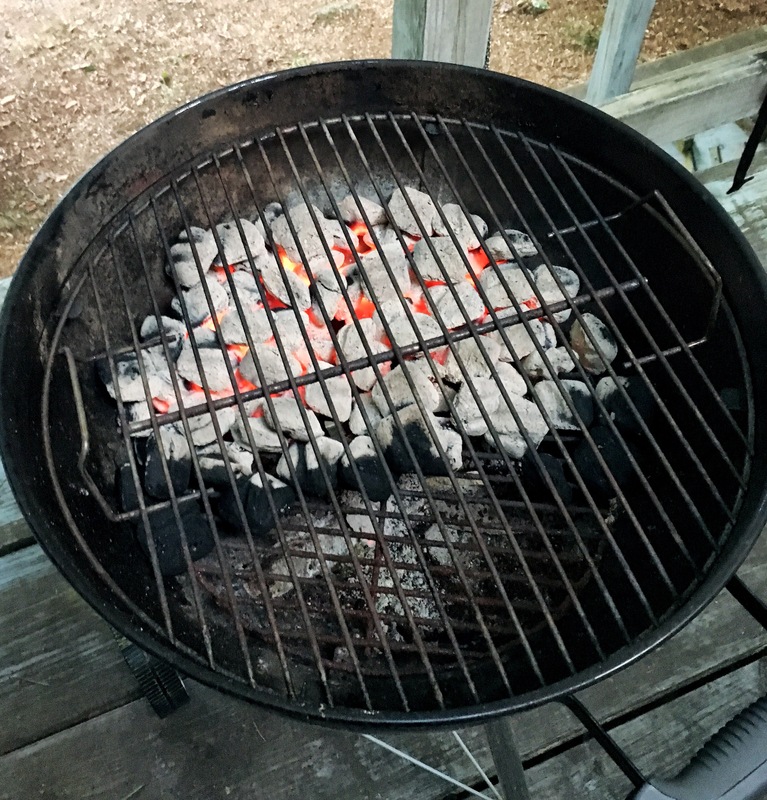 Heat up charcoal or gas grill. Open English muffins gently with a fork and toast. Set aside. 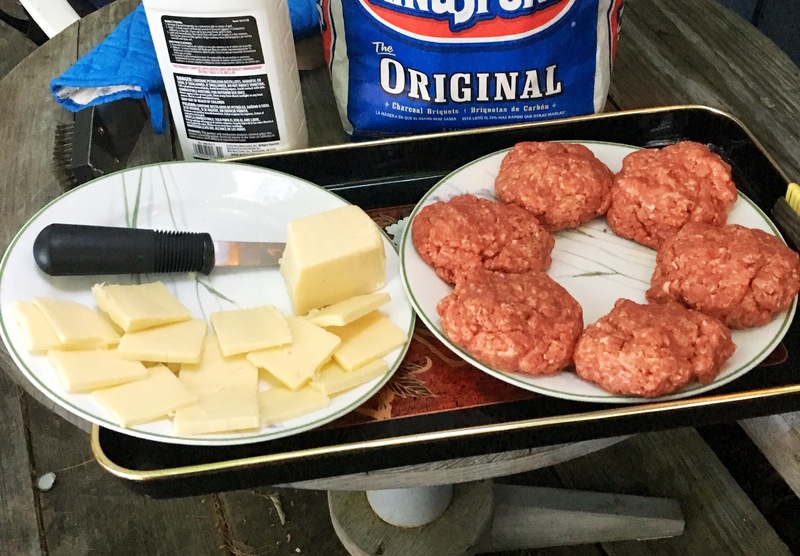 Thinnly slice the cheese and make enough slices to cover 6-8 hamburger patties. Set aside. Cook bacon to desired crispyness and cut each slice in half. Set aside on a paper towel lined plate. 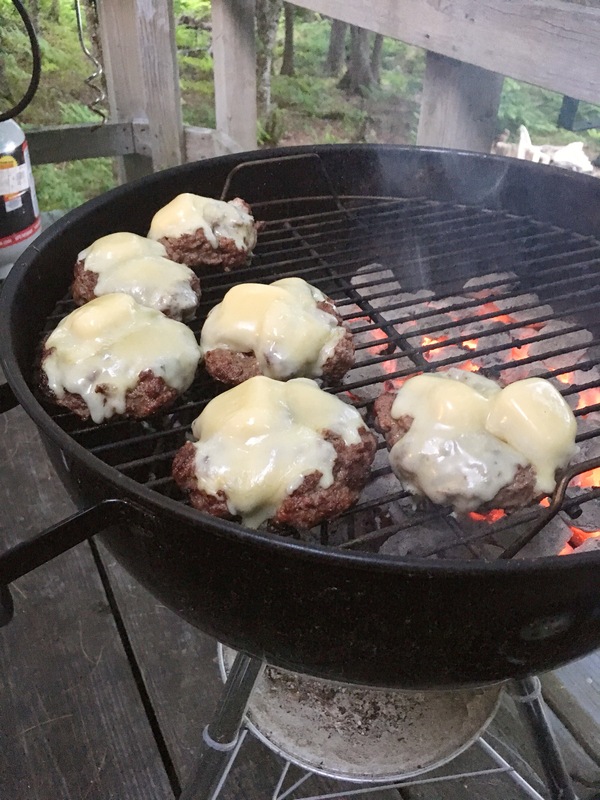 When just about finished grilling the burgers, move them to a cooler spot on the grill and top with cheese. Cover the grill and let cheese melt–about two minutes. 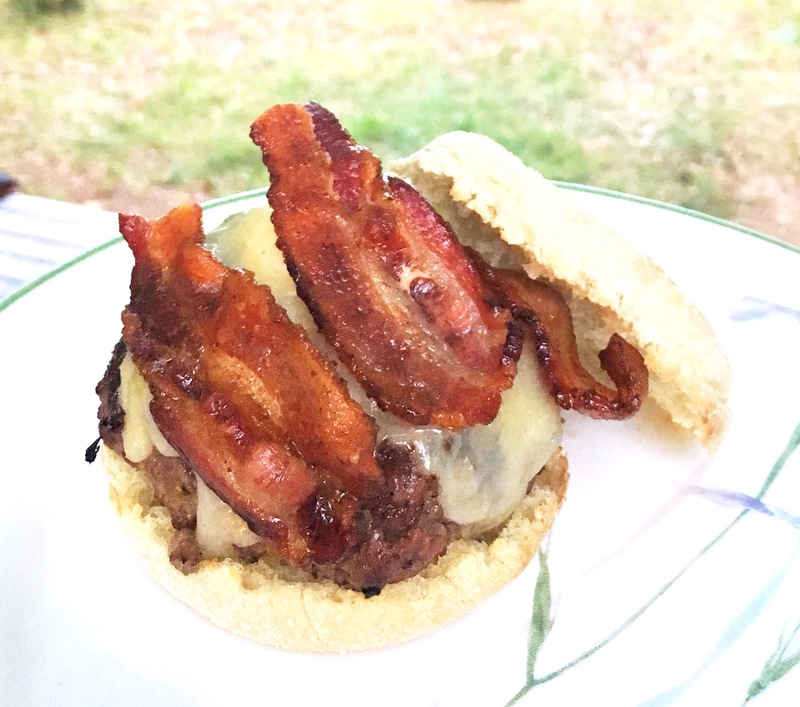 Place hamburger on one half English muffin and top with three or so pieces of bacon and ketchup if desired. Place remaining half of English muffin on top and enjoy! 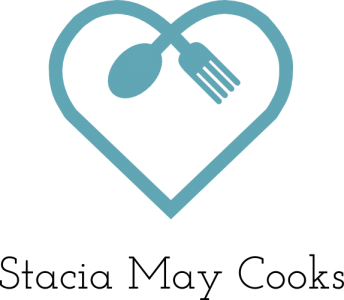 I never did either until this recipe, it was amazing! Soaked up the juices without getting soggy! Sounds delicious! Will have to try the English muffins as buns, what a cool idea. Oh, and I remember your moms pickled beans! I always loved those!